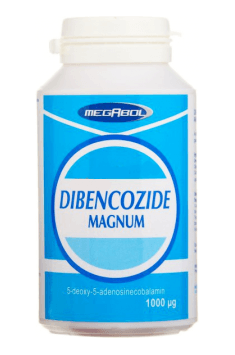 Dibencozide Magnum - a unique combination of strong muscle mass stimulant - Dibencozide with the strength of vitamins from group B having influence on anabolic abilities and metabolic functions of organism. Dibencozide (co-enzyme of vitamin B12) is a non-steroid metabolic agent with strong anabolic impact. It facilitates increase of lean body mass, supports muscle tissue development, improves strength parameters and considerably improves appetite. It has positive impact on overall feeling and general body condition. It relieves symptoms of weariness after physical exercise. 1 capsule per day, 30-60 minutes before training. 1 capsule per day in the morning - on an empty stomach or before bedtime. The product has a very cool effect on people without or with limited appetite. In case of very intense and long training dosage can be increased to 3 capsules daily. MEGABOL is one of the oldest Polish companies producing dietary and nutrients bodybuilders. In the wide range of this brand are supplements speeding up growth of muscle tissue, such as protein supplements, supplements based on plant sterols or egg protein insulators. Also worthy of note are fat burners, gainers, creatine and taurine supplements. Valuable species of blue-green algae. Effectively cleanses the body. Niacin's beneficial effects on blood lipids is well-documented. It also promotes cardiovascular health. Supplement containing extract of milk thistle seed. Supports liver and removes toxins. Oil of garlic in capsules. It regulates blood sugar, improves immunity, digestion and circulatory system. A supplement containing omega-3 fatty acids (EPA and DHA). Supports eyesight. Adenosylcobalamin - a biologically active form of vitamin B12, which similarly to its methylated form does not need to undergo additional biochemical transformations in order to enter metabolic pathways in the human organism. Apart from the best assimilability, adenosylcobalamin is distinguished from other forms of vitamin B12 by its high affinity for regeneration of nervous tissue. It is indicated that this form of cobalamin is engaged in the production of myelin sheaths with key meaning for proper neurotransmission. Apart from this, vitamin B12 is conducive to maintaining optimal functionality of the nervous system, being conducive to the synthesis of neurotransmitters. Vitamin B12 is also an incredibly important regulator of methylation process, thanks to which its supplementation positively influences metabolism of the whole organism. It is a coenzyme in the conversion reactions of homocysteine to methionine as well as methylmalonyl-CoA to succinyl-CoA. Because of the first reaction, proper supply of vitamin B12 is also conducive to maintaining high concentrations of S-adenosylmethionine, thanks to which it positively influences mental functions. Moreover, vitamin B12 is a key regulatory factor, taking part in erythropoiesis, i.e. the process of forming red cells. Its improper supply may be the cause of the development of the so-called vitamin B12 deficiency anemia. Supplementation with vitamin B12 should be considered especially be people on vegetable diets and those who take drugs from the group of proton-pump inhibitors (PPIs) and metformin. The influence of diet on acne: fact or myth?